Three years ago, my wife, Mary, and I rescued a dog from a local shelter. Charlotte quickly became a part of our family and one of my best friends. We know how life-changing adoption can be for homeless pets and their new families. Charlotte has brightened each of our days since October 1, 2015 and we only hope we do the same for her. In 2018, PAWS Chicago facilitated over 5,500 adoptions, provided medical care for over 2,300 pets from underserved communities, performed over 16,600 free/low-cost spay and neuter surgeries, and saved over 98% of animals brought into our care! This March 24th, I will be running in Chicago's 8K Shamrock Shuffle to raise essential funds for PAWS to help even more homeless pets this year. My goal is to raise $662, the average cost of treating one sick or injured pet, from rescue to adoption. PAWS Chicago is dedicated to building No Kill communities – starting with a No Kill Chicago – where all healthy and treatable pets are saved. 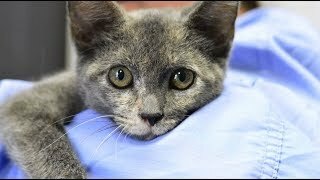 Since PAWS Chicago’s founding in 1997, the number of homeless animals euthanized per year in Chicago has dropped more than 87 percent. But there is more work to be done and your generosity is crucial to this effort. If you are feeling extra generous, please consider sharing my page with your network. Thank you for your support! Thank you Christine for all that you do to make the world a better place! We love you! Puuursonally happy to donate towards the $662 goal to help ensure a sick or injured pet can move past a ruff life towards a barking amazing adopted life!